Product prices and availability are accurate as of 2019-04-17 17:38:02 UTC and are subject to change. Any price and availability information displayed on http://www.amazon.com/ at the time of purchase will apply to the purchase of this product. Welcome to our store HEIMO. All dresses is sold by HEIMO,only HEIMO is the authorized seller,if the dress you received is sold by other seller,you need complaint the seller to AMAZON,they have to refund all payment include the shipping cost,and you can still keep the dress for free as gift!!! 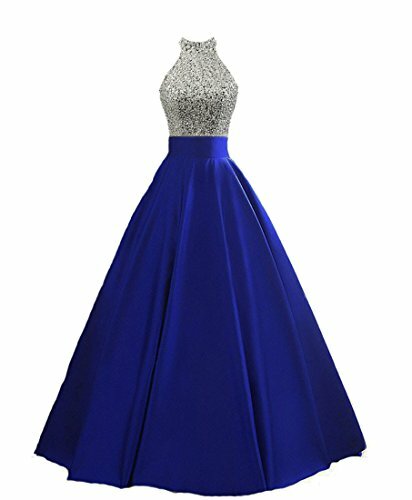 Long Halter Open Back Beading Evening Party Dress Sequins Formal Prom Gown 2018 This listing have 2 styles,different top style,please check it before placing your order Conact Us:You can email us after placing your order, choose your order, click get help for this order, then you can contact seller directly Occasion:Formal Party, Dating, dancing, clubwear, night, club, going out, cocktail party, Banquet, Wedding, Ball, Prom, Christmas, Special Occasion HEIMO is a registered brand.Some seller sales Imitations,please make sure the dress is sold by HEIMO at checkout when adding it to cart.Only HEIMO is the authorized seller,if the dress is sold by other seller, you will receive Imitation,you can complaint about the seller to AMAZON,they have to refund it,and you can still keep the dress for free as gift!! !